In this episode of The Engineering Commons, we answer questions from listener Jared about coping as an engineering student. Carmen informs us that making accurate estimations is an important engineering skill. In this episode, we answer questions from listener Jared about surviving the math-science death march encountered in the typical engineering curriculum. It’s normal to “just get by” in some of your engineering courses; not every class will speak to your academic strengths and professional interests. Brian notes that engineers and mathematicians approach math differently. MIT professor Gilbert Strang has argued that linear algebra should be emphasized over calculus in the engineering curriculum. Many systems do not have a closed-form (analytic) solution, as it the case with the n-body problem. It is common for engineers to use only algebra during their professional careers, but the training received in advanced math seems to prove beneficial. We once more stumble onto the long and glorious history of the Turbo-Encabulator. Jeff made heavy use of note cards while preparing for his area exams. Carmen benefited doing his engineering homework as part of a study group, while Brian found open-ended research projects the best way to master important material. Even when the semester is not going well, it’s important to avoid writing off a class entirely. Brian finds value in watching the slightly unconventional YouTube videos of ElectroBOOM, while Carmen enjoys the educational aspects of Alan Wolke’s electronics tutorials. Someday, in the distant future when he has more time, Jeff would like to construct the coffee-can radar developed by Gregory Charvat. Spaced repetition is a learning method that revisits material in accordance with a schedule designed to maximize retention. Repeated retrieval of information from memory is one of the best ways for students to master scientific topics. Students don’t necessarily learn any more from a charismatic lecturer. One can find lots of advice on surviving engineering school, but keep in mind that the objective is becoming an employed engineer. 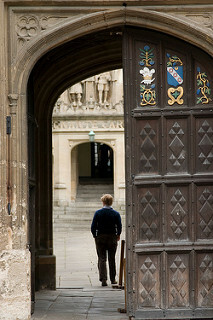 Thanks to Jimmy Harris for use of the photograph titled “Oriel College, Oxford.” Opening music by John Trimble, and concluding theme by Paul Stevenson.